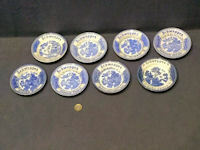 Original, quality post-war blue on white ceramic coasters all in the willow pattern Schweppes advert but each with a different flavour and made by a variety of companies. Indian Tonic, two versions, Devonshire Cider, Cider, Ginger Beer, Ginger Ale, Sparkling Grapefruit and just Schweppes. All are perfect. 4.5" to 4.75" diam and 0.75" to 1" tall. Price is for the eight. 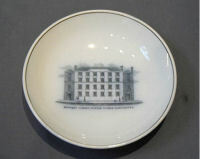 Original, quality shallow circular dish, with transfer decoration in blue on white detailing a picture of a four storey building entitled "Bennett Street Sunday School Manchester". The reverse is transfer printed for the manufacturer 'Davenport Longport' with the year stamp for 1848. 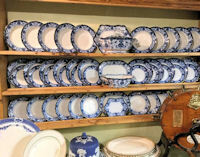 A super looking, perfect dish with local history. 6.75" diameter x 1.5" front to back. 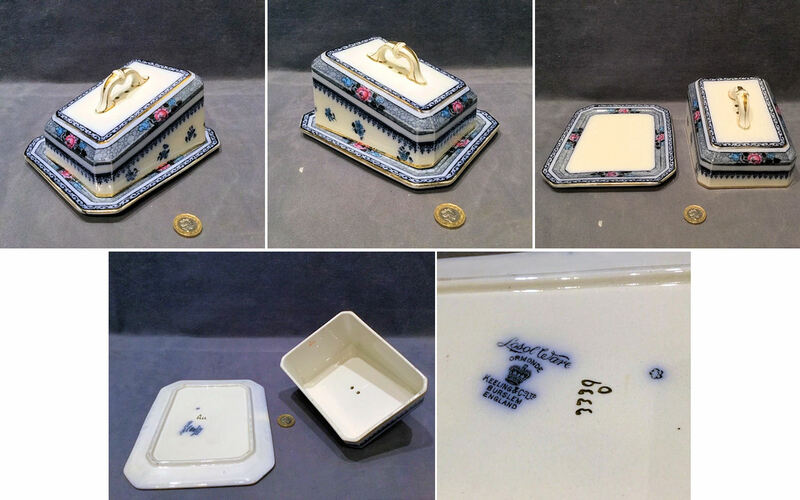 Original, quality circa 1900, two piece blue on white cheese dish and cover with a handle to the top and decorated with details in blue with red roses. 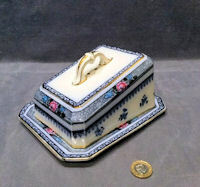 The underside is transfer printed "Losolware, Ormonde & Keiling & Co Ltd Burslem England" for the manufacturer. A smaller example but perfect and in good order. 7.5" x 6.25" and 4.5" tall. 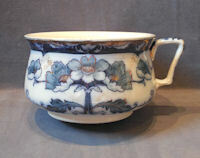 Original, quality late 19th century blue decorated on white chamberpot. The underside is embossed with an unclear registration lozenge mark. Very small star crack to the interior, not visible to the outside, otherwise all is complete and in good order. 5" tall, exterior diam 9.5" and total 11" including handle. 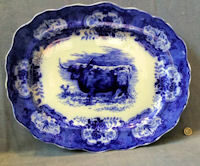 Original, quality late 19th century blue decorated on white chamberpot, with two cameos and decorated top and bottom rims. The underside is transfer printed "Georgian" for the pattern and "Wood and Son Burslem" for the manufacturer. Complete and in good order. 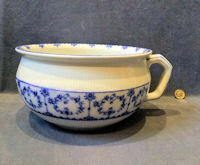 5.5" tall, top rim 9" diam, base 6.5" diam and widest 11" including handle. 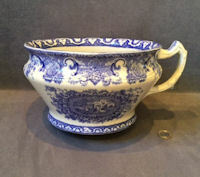 Original, quality, flow blue on white decorated ceramic chamberpot, circa 1880. This superb Art Nouveau example has detail of anemone flowers with leaves and a gilt dusting in places and to the underside for the manufacturer "F & S Thuro Burslem". All is complete and in good order. 9" top diameter and 5.5" tall and 11.5" wide including handle. 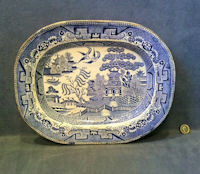 Original, quality 1920's, blue willow pattern on white, ceramic chamberpot, with three repeated pictorial panels and a decorated inner top rim and handle. 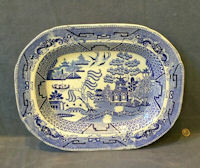 The underside is detailed "Royal Corona Ware" over a crown with "Hancock and Son, Stoke on Trent" beneath and the mark for the years 1912 to 1937. All is in super condition. 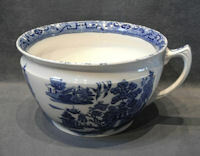 8.75" top diameter x 10" wide including handle and 5.25" tall. 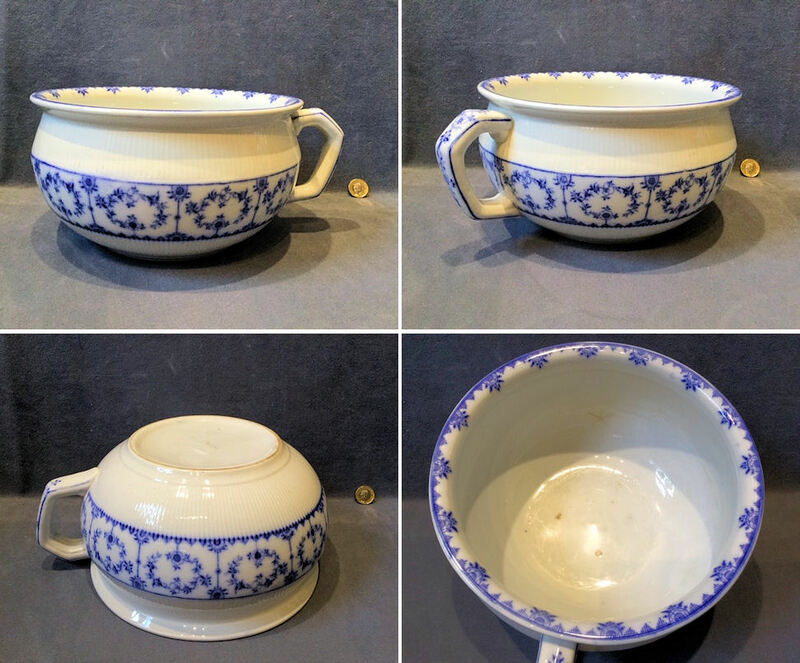 Original, quality circa 1900 / 1920's ceramic salad bowl with a silver plated top collar and a matching pair of salad servers with ceramic grips and silver plated tools. These three pieces are decorated in blue on cream coloured designs of nasturtiums with leaves and gilded flashes. 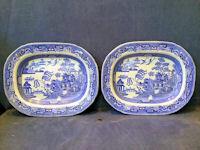 Although the plated rim to the bowl is little rubbed the servers appear to be unused. Complete and in superb condition and ready for use. Bowl 9" diam x 4.5" tall. Servers 11.25" x 2" x 1".